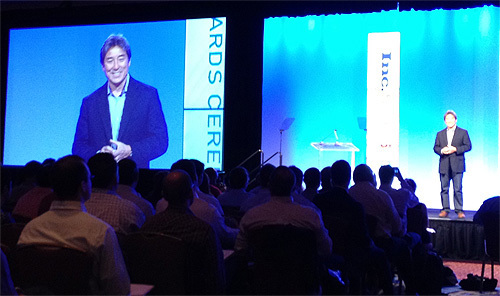 At the Inc. 500/5000 conference I attended last October, Guy Kawasaki offered an informative session about cultivating and maintaining “enchantment” in your customers or clients. Since then, I have been summarizing those points, off and on, and discussing how they are applicable for us at Outskirts Press so perhaps they can also help you apply the information to your own entrepreneurial efforts (starting a business, running a company or yes, even marketing a published book). Step 8 is to use technology. Once again Guy demonstrates his admiration for Apple, Inc. by creating a “Step to Enchantment” that is so reflective of what Apple does incredibly well. Yes, last time I mentioned that Apple was all about presentation, which may have implied Apple values flash over substance. On the contrary, Apple is one of those rare companies that actually delivers the substance (the technology in this case) to back-up the hype (their flash, their presentation). With this step, Guy suggests that great companies can use technology to enchant their customers by smoothing over, and even removing, potential “speed bumps.” A speed bump, of course, is anything that gets in the way of the customer having a flawless experience with that company’s product, service, or brand. The Internet (and more recently, social media) has given all start-up businesses, as well as established enterprises, an equal opportunity to use technology to provide valuable information, insights, and assistance to their clients or customers. What used to be a costly and time intensive exercise of direct-mail notification or phone calls can now be accomplished instantly via email or the company’s Facebook or Twitter pages; all the business needs to do is actually use these new technologies that are available to interact with their customers or clients — and let potential new customers or clients experience that dialogue transparently, in real time. As technically sophisticated as our self publishing website is at Outskirts Press, I feel we could perform this step better. It becomes more difficult to “use technology” effectively when a customer base spans the age groups between 8 and 80. Apple is an amazing company with amazing technology simply because an eight year and an eighty year old can often have the same smooth, enjoyable experience with an Apple product (except when upgrading to mobile OS 6 deletes your cloud contacts and calendar, ugh, but I digress). An 8-year-old can use our online system just fine. 80 year-olds, on the other hand, sometimes find the experience a little confusing. Fortunately, we offer Publishing Consultants and then Author Representatives, who are available to walk every one of our clients through the entire process, not unlike the Apple clerks at your friendly neighborhood Apple retailer (except you don’t have to drive to our consultants to get the help you need). At the not-so-recent Inc. 500/5000 conference I attended at the beginning of October 2012, Guy Kawasaki offered an informative session about cultivating and maintaining “enchantment” in your customers or clients. I am (and have been for several months) in the middle of summarizing those points and discussing how they are applicable for us at Outskirts Press so perhaps they can also help you apply the information to your own entrepreneurial efforts (starting a business, running a company or yes, even marketing a published book). And, in the meantime, you should get Guy’s book, “Enchantment” for the total skinny. Step 7 is to present. What does this mean? It means that customers/clients become enchanted with companies and/or people who have learned the art of presentation. Again, Apple provides a very good example of this (it is almost as if Guy reverse-engineered everything he thinks Apple does “right” to arrive upon this list in the first place, because let’s face it — Apple is one hell of an enchanting company). Everything Apple does is about presentation, from its commercials to its retail stores to the very boxes their products arrive in. What other company can boast that its customers keep the BOXES of their products? Apple’s presentation is so good, in fact, that its customers are liable to ignore (or quickly forgive) gross mistakes that would incite riots if perpetrated by lesser-liked companies (Apple Maps, anyone?). Since we’re currently in the middle of a series of posts about Guy Kawasaki (the proclaimed “evangelist of Apple), it’s not too far removed to take a small intermission today to mention the “Cyber Monday” special we are offering at Outskirts Press on one of our Apple options. In this case, the option is our iPad/iPhone Premium Edition e-book option, which includes a private label ISBN and iBooks distribution. Since Cyber Monday deals have to be huge, we’re offering a whopping 50% on this popular option for one day only (today) with the promotion code CYBERAPPLE entered in during check-out. This is an option we offer to all others, regardless of whether they have published their book with Outskirts Press or elsewhere (or haven’t yet published their book at all and want to enter the e-book game), so it really represents a great opportunity for all authors. If your book isn’t yet on the iPad and distributed through iBooks, this is your chance to make it happen, and enjoy an amazing discount at the same time. All the details are on our Outskirts Press blog by clicking here. My favorite presenter at the recent Inc. 500/5000 conference was Guy Kawasaki, who offered an informative session about cultivating and maintaining “enchantment” in your customers or clients, so perhaps this series of posts in which I summarize those points and discuss how they are applicable for us at Outskirts Press will also help you apply the information to your own entrepreneurial efforts (starting a business, running a company or yes, even marketing a published book). And, in the meantime, you should get Guy’s book, “Enchantment” for the total skinny. Step 3 is to offer a compelling product or service. According to Guy, the first quality of a great product or service is that it is deep. Great products or services are also intelligent, complete, empowering, and elegant. Of course, being an “Apple Guy” (ah, that was humorous), Guy uses the iPhone as the perfect example. In fact, he uses just about any Apple product as an example, and he’s right. Apple is on its way to becoming the first company valued at over a trillion dollars because it delivers upon Step #3 so well. Look at your product or service. Is it deep? Is it intelligent, complete, empowering, and elegant? Our self-publishing services at Outskirts Press deliver upon 80% of these five traits. Our services are deep in the breadth of options we offer, from ghostwriting, to custom interior design, to full-color illustrations; and we offer more marketing services than anyone else, ranging from the practical (press release writing) to the silly (custom shoes featuring your book cover). Yes, “deep” is something we offer in spades. This list of options also makes our services intelligent and complete, and there’s nothing quite as empowering as self-publishing a book and then watching it succeed. Where we admittedly fall short is with our elegance. There are services that offer DIY (do it yourself) self-publishing in a more elegant manner than we do, usually through the use of computers and algorithms that treat each of their books and authors like a series of zeros and ones (assembly language for an assembly line of books). In other words, their front-end systems and websites are elegantly designed, programmed with efficiency, and can produce thousands of books that look and feel exactly the same. Yes, that can be misconceived as elegant, and when compared with DIY services such as those, our human touch can seem particularly inelegant because, well, human beings often lack elegance. But what inelegant human beings bring to the publishing of your book is something that cannot be replaced by a computer, no matter how elegant it seems, no matter how short and concise the domain name is, and no matter how “fast” the computer can format a book and spit it out to the masses. You know what? That is one elegant looking ceiling. While we were in the middle of the Outskirts Press Pre-Production series of blog postings in February, our Outskirts Press blog over at http://blog.outskirtspress.com introduced a video contest in association with Valentine’s Day, titled “Show Me the Love” where we asked our satisfied and successfully published authors to record a 1-3 minute video about either being a published author, their experience with Outskirts Press, or why they loved working with us. The videos we received were great! We posted them all on Facebook as we received them. Then our Facebook friends “liked” them or commented on them in accordance with normal social media behavior. This allowed us to determine 6 “finalists” based upon the number of likes and/or comments each video received. We then posted those 6 video finalists on our blog along with a poll, asking our blog readers and members of our social community to vote on the video they liked the best. The winner would receive a free Apple iPad 2. It was an interesting race, with two finalists battling back and forth in the polls up until the last hour, at which time, one was crowned the winner. Video testimonials like these are valuable components to running successful online businesses nowadays, because people on the internet are now more likely to “watch” the Internet than they are to “read” it (and yes, I recognize the irony of making that claim in a manner that requires it to be read). 3. Yes, you may have to offer an incentive to participate. As popular as Skype may be, it’s still a taxing procedure for most people to create a video, and the likelihood of it being spread across YouTube and the rest of the Internet is not for the faint of heart — particularly for writers, the majority of whom are often introverted. In our case, we dangled an Apple iPad 2, but your gift could be something as easy as a signed copy of your book, for example, or a product or service that you deliver. For instance, our runner-up, received a free iPad edition of her book (which actually has approximately the same retail price as the iPad 2 itself, so they were both big winners). 4. Once you have video testimonials, use them. Nothing is quite as persuasive as seeing real people making really great comments about your product or service. So, with that said, take a look at all six of our video finalists by clicking here. Pretty good arguments to use Outskirts Press, wouldn’t you say? A couple weeks ago I started a new series on this blog with the purpose of helping our authors get featured on our free self-publishing app for the iPhone 4 (available for free download by clicking here). While that was the specific goal of the series of postings, in more general terms, my advice (and the advice I will continue to provide this week) extends to all authors from all publishers who are interested in securing a little more “attention” from their publisher. You see, the self-publishing industry is BIG, and there are only a handful of self-publishing firms handling the vast majority of self-published books. Now that publishing is so easy, getting exposure for your book after publication becomes one of the major hurdles self-publishing authors face. The degree to which you have an opportunity to get ANY exposure for your book depends upon the self-publishing company you choose. Some, like Outskirts Press, offer a lot of opportunities. Others don’t offer any; they’re done with you the moment your book is published. The blog series a couple of weeks ago discussed 6 different ways our authors can receive exposure for their books on our blog, which would also result in being featured in our iPhone app. The “Blog” section is just one section of the app. There are three others: Authors, Videos, and Twitter. I will discuss those opportunities this week, beginning with the “Authors” section tomorrow.